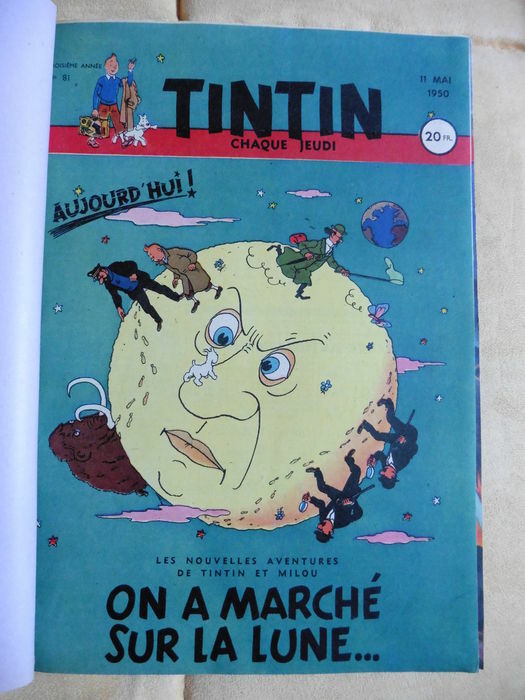 Explorers on the Moon (Original: On a Marche sur la Lune) is the seventeenth comic of the Adventure of Tintin series. The comic published weekly from October 1952 to December 1953 at Tintin magazine. This comic is the sequel of Destination Moon. Who is the first human to step onto the surface of the moon? 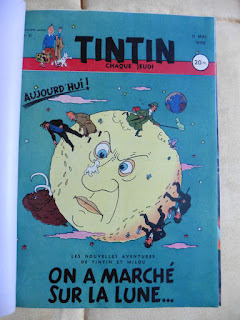 It is not Neil Armstrong in 1969 but It is Tintin in 1953! A great Science Fiction comic of that time. Under the direction of Professor Calculus, the first manned rocket is hurtling through space. Onboard are Tintin, Snowy, Captain Haddock, Frank Wolff. Soon after takeoff they discover that the detectives Thomson and Thompson have accidentally stowed away on board, putting a strain on the oxygen supply. Are only they are in moon?